Whether it’s to cover up a scandal or score a business contract, acts of bribery are common throughout the world. We recently asked people in 44 countries how important certain attributes are for getting ahead in life (with 0 meaning “not important at all” and 10 meaning “very important”). While “giving bribes” ranks at the bottom compared with other factors (“having a good education” tops the list), several countries stand out for their scores when it comes to greasing the palm. In China, bribery is a recurring issue, so much so that Communist Party officials focused their 2014 plenum on anti-corruption efforts, among other rule-of-law topics. One of the most popular acts of bribery in China is gift-giving to secure government contracts, according to a 2012 World Bank survey of the Chinese business sector. To gain more insights, we looked at the distributions of people’s responses on bribery on the 0-to-10 scale within each country’s population. In our survey, the Chinese public tends to rate the importance of “giving bribes to get ahead in life” as somewhat important (half rated it between a 6 and a 9). Just 3% say bribery is very important (rating of 10), and 5% say it is not important at all (rating of 0). Whether young or old, male or female – the Chinese public views bribery similarly. 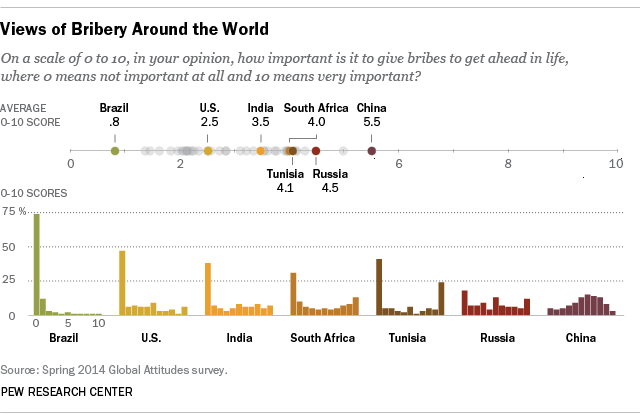 By contrast, people in Tunisia are more polarized on their views of bribery. While the average score is 4.1, more people choose either 0 or 10 than any other rating in between (41% choose 0, 24% choose 10). It’s worth noting, though, that a higher share of Tunisians choose 10 than people in any other country surveyed. Younger Tunisians (ages 18 to 29) are also more likely than older Tunisians (ages 50 and older) to say giving bribes is very important, choosing a 10 by a 30% to 19% margin; whereas older Tunisians are more likely to say it is not important at all (50% vs. 32% select 0). In Brazil, the country least likely to say giving bribes is important, a solid majority (74%) says bribes are not important at all. In the U.S. – where money’s influence in politics also makes plenty of headlines – 47% say giving bribes is not important at all for getting ahead, and 6% say it is very important.